The TDINV3000W050 3.0 kW inverter evaluation kit from Transphorm, Inc. provides an easy way to evaluate the performance advantages of GaN FETs in various inverter applications, such as solar and uninterruptible power systems. The kit provides the main features of a single-phase inverter in a proven, functional configuration, operating at or above 50kHz. 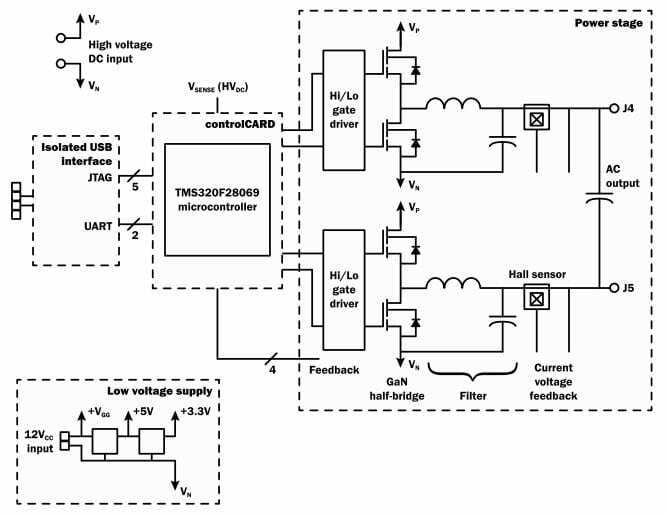 At the core of the inverter are four TP65H050WS 50mΩ GaN FETs configured as a full bridge. These are tightly coupled to gate-drive circuits on a board which also includes flexible microcontroller options and convenient communication connection to a PC. The switch-mode power signals are filtered to provide a pure sinusoidal output. The TDINV3000W050-KIT is for evaluation purposes only. The control portion of the circuit is designed around the C2000™ family of microcontrollers from Texas Instruments (TI). The source code is available along with related support information directly from TI. In addition to this general resource, Transphorm provides original firmware which comes loaded in flash on the microcontroller. The source code, configured as a complete project, is available as part of the evaluation platform. This project is a convenient starting point for further developments. The microcontroller itself resides on a small, removable control card, supplied by TI, so that different C2000 devices may be used if desired. The schematic for the TDINV3000W050 circuit board is provided at the end of this user guide document, as well in the design files. Power dissipation in the GaN FET is limited by the maximum junction temperature. On The Web: Transphorm Inc.